OK, so I’m in a hurry because I sort of need to pack to go to Omaha, um, today. Didja hear about our little transit strike? I think we might be walking to Newark to catch our flight. I’ve been doing a modest amount of seasonally-induced crafting. So I’m going to show you a bunch of pictures now, and then I’ll be away from the blog for about a week. Roll up boys’ sleeves. Give a pep talk about not slopping water all over the dining room (pep talk will be accompanied by boys slopping water all over the dining room). Decide you don’t care about the dining room. Take a deep breath, and just Let It Go. Pull off golf-ball sized chunks of roving in colors chosen by boys, roll into loose balls. 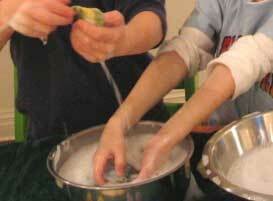 Allow boys to dip the balls in warm water and roll in their hands (“like play-doh!” “like cookies!”) until very foamy with soap, then dip in cool water. Keep rolling and dipping in warm and then cold water until the balls begin to shrink and harden slightly. When balls are ‘done’ as determined by boys, make more balls. When sister comes home, set her to work. Continue to make felt balls yourself as boys tire and sister does homework. Try not to think about the dining room table. 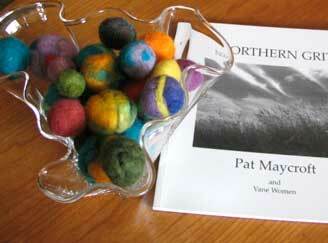 Expect to find felted balls in various stages of feltedness in and around the dining room, for several days. What I learned: The soapy water doesn’t have to be hot. The balls will be smoother on the outside, and less prone to cracks and crevices, if you work them slowly and softly at the beginning. When you feel them starting to shrink, that’s when you can apply more pressure to shape them. …filling up a wedding present flower vase that always tips over when filled with flowers and water. …making ornaments to accompany Teacher Chocolate. These ornaments involved buttons, craft glue, and tiny beads and more dining room trauma. Between you and me, we’re not doing the craft glue. Ever again. When I visited Cristina a couple of weeks ago, we made some felt stuff. Not a lot, due to time constraints and the fact that I wouldn’t stop talking for 5 minutes. 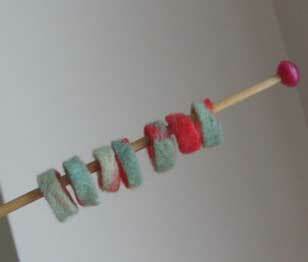 I made Felt Ring Stitch Markers. I wound roving around the handle of a wooden spoon and felted this tube using my hands and one of those sushi-rolling mats. Later, when the tube was dry, Cristina snipped little calamari rings. Which I think make excellent stitch markers because they won’t get stuck on knitting, nor will they go zinging across the floor. Cristina made a small flat piece of felt. This just in: I’ve made a robot. MY NAME IS N-D-GO BOT, FROM THE PLANET E-LANN. 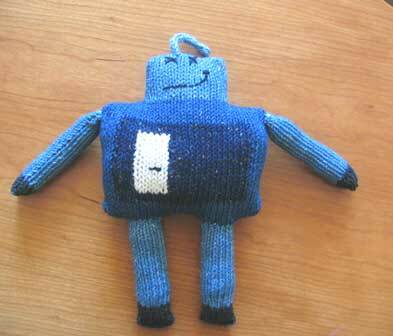 MY MISSION IS TO GET THOSE WHO HAVE NO DESIRE TO MAKE KNITTED TOYS, TO MAKE THEM ANYWAY. I succombed to the lure of the Jess Hutchison toys. Can you blame me? Look at him! 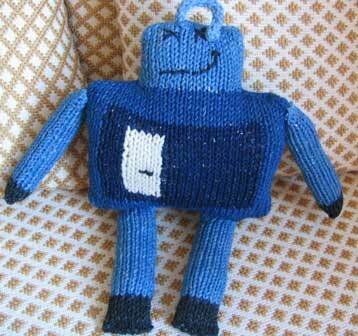 World’s cutest handknit mechanical device! As toys go, the bot is not too fiddly–his lines are all straight and his body, legs and head are made in 2 pieces, front and back. The best moment is when you start stuffing the legs and they go all roly-poly on you. (Shut up! You have to either try it or take my word for it.) My next toy will be: Squarey. I’ve got a serious crush on Squarey. Happy whatever you’re celebrating down there with the bourbon milkshakes and the ultra-festive heirloom sweaters. We’re off for a good old-fashioned Chrismukkah in Omaha. 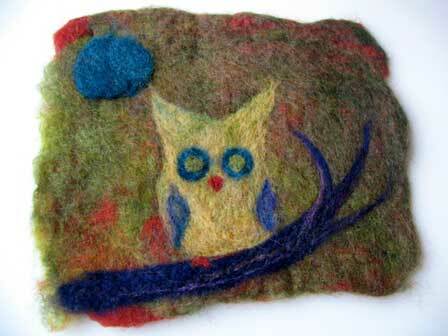 I love all the felting ideas. Here is one you will have to try in the future, after your hike to Newark. I am not sure how to do the link, but here it is below. 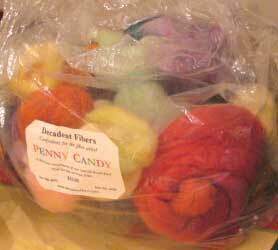 Basically, wrap styrofoam balls (the rough kind) in fleece and then felt. It makes lovely lovely ornaments or larger, much lighter balls for cat play or to fill large glass vases that tip. I love that Robot! So very cute!! Is that a DENIM robot? I hope you get to the station on time!! Happy Holiday. I’ve been making Spherey and I love him; they are all adorable. Very nice. Kay, I hope you and your family have an uneventful flight to Omaha for Chrismukkah. May Santa fill your knitting bag with Rowan Denim! I will miss you. Have a good Chrismukkah. Oh and if you can somehow get to Penn Station, the train to Newark is an excellent option. Not sure though how you’ll get down there. You could drive and leave your car at my house, too, if you want. Another option. Let me know if I can help in anyway. Way to ruin Chrismukkah, nu? I heart your crafting glimpses. Fun felting applications, square toys, denim-ish moons! What more could a girl ask for!? p.s. if I don’t get a chance to tell you, have a GREAT Chrismukkah. Ciao! I own that vase! Now I know what to do with it! Have a great holiday! i love your robot’s face! so cute. Kay & family – have a lovely Christmukkah!!! 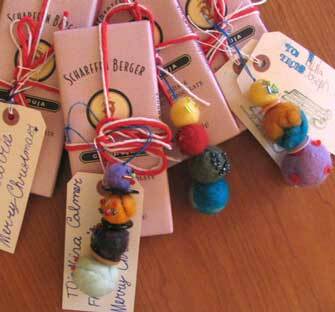 Love the felted balls and the toy – fabby! Happy Chrismukkah and safe travels to you and Ann and the families! Thanks for sharing the Jess Hutchison toys–I’ve got a nephew and a soon-to-be niece who clearly need all of them! I hope this here transit strike doesn’t cause too many problems getting to the airport–I’ll keep my fingers crossed for y’all! I gave up on getting to work today–perfect excuse to stay home and knit or stitch. Or both! Oooo…maybe I’ll go felt some balls in honor of the whole event. Commemorative felt balls! This is FABULOUS! Angel just made some of these with bells in them for her baby. So cute. ro-bot guy would make the most wonderful-est xmas tree decoration! LOVE…..
Would it be wrong to marry the Robot? I mean, he’s so damn cute…can you even stand it? I love Spherey – I may have to make him! There is so much to respond to in this post. I really just can’t even attempt it. 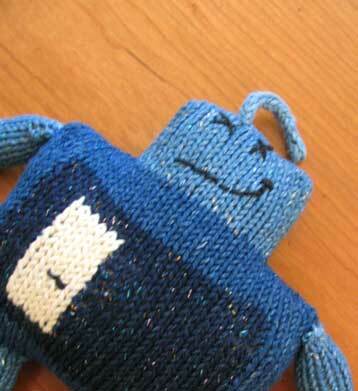 I love all the felting, and the robot? Well, I didn’t see it coming. Kay and robots? Who knew. But then, I knitted a bird. And then a duck. Didn’t see that coming either. Your robot is fabulous! Dayum, that looks like a bucket of fun! And such wonderful teacher gifts. Have a wonderful Chrismukkah and a Howling Humbuggery. Hi Kay, Hope you do not need to run to your plane. I saw the news here in Hong Kong and hope the strike stops soon. Your felt balls looks so yummy. The thought just occurred to me that I hadn’t read about what you guys are up to for a while- and I realised that somehow I’d inadvertently lost you from my bloglines. Must have been the cat. In anycase- glad I realised in time to see all your felting and roboting action- I WILL try some felting over the holiday break. thanks for the ballsy tips! And I hope you have a fabulous festive season. I love the denim robot and I hope I’m not the only one whose inside my head reading voice turned into a robot voice when I read those words. Oh my gosh! Felt Easter eggs…my cub scout spring craft project!! Thanks! !